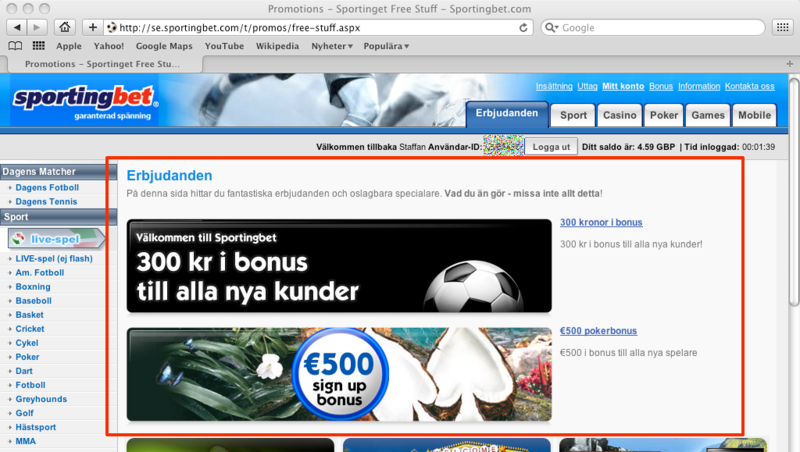 I play poker at ParadisePoker.com on a regular basis and today when I wanted to check my gaming history at Sportingbet. When I looked around on the portal I noticed the Promo page (I was on the Swedish site) and I was surprised that the promos they had their wasn’t personalised after who I was. Why do they have these promos for me when they know that I’ve been a Sportingbet player for a few years? Insted they should have promos significant to what I’ve done previously. They know my gaming history, how much I usually add to my account when I add funds and how often I play. I think Sportingbet should take it a step further than offering a promo page. They should show the promos on the start page right after I’ve logged in! So today’s redesign is only changing a few banners on their promo page, but it is a big difference to offer personalised promos based on previous gaming history from todays static promos.